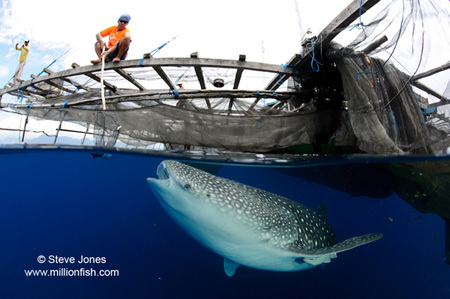 Earlier this month, my image of whaleshark under a fishing platform, which I took in Indonesia last year won 3rd place in the colour prints category of the FESTIVAL MONDIAL DE L’IMAGE SOUS-MARINE. This festival is hotly contested, drawing in entries from around the world, so it’s a particularly pleasing result. Fortunately the fishermen that live on the platforms embrace the sharks company during their long lonely stints at sea, but the image does draw attention to how vulnerable these harmless giants are – their docile trusting nature makes them an easy target for shark finners, and they are listed as threatened on the the IUCN red list of endangered species.